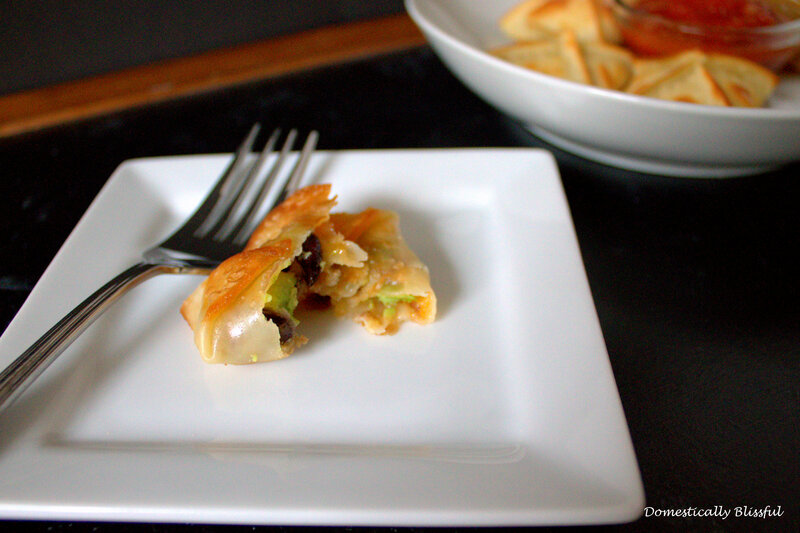 By now I am sure you have noticed that I love using wonton wrappers! 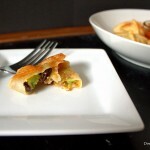 Out of the three wanton recipes that I have posted so far these Mexican Wontons are my husbands favorite – especially when they are fried, so good! Although I do love creating with wanton wrappers, the real reason I have been working with them so much recently is because there are a million little wonton wrappers in just one package – not really but it seems like they do, especially when you are only cooking for two! These delicious little Mexican Wontons can be fried or baked – just like the Wonton S’mores and Caprese Bites. *Please remember to be careful when cooking with hot oil because there is always a possibility of splattering oil – and getting burned is not fun. 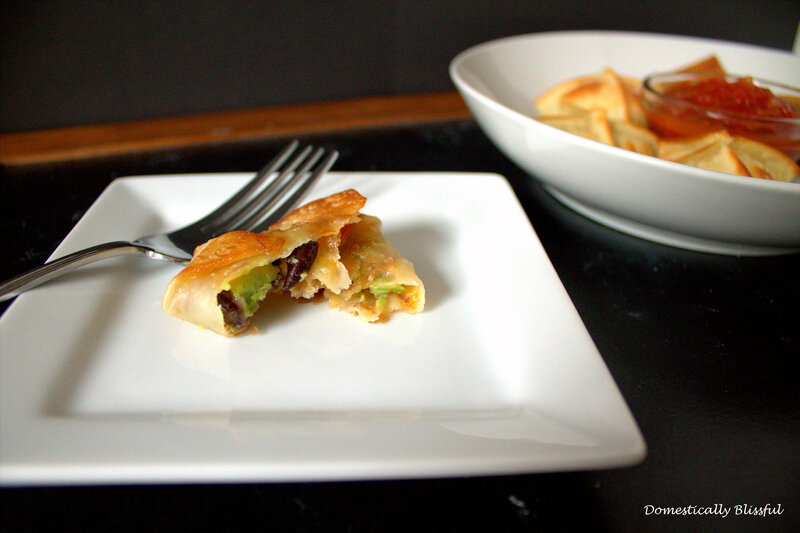 Place a few black beans, a piece of avocado, and some shredded cheese on top of each wonton wrapper. Brush the edges of the wonton wrappers with water and follow the directions below to seal each Mexican Wonton – there are two different ways depending on if you are frying or baking them. Seal the wonton wrappers by folding one corner across to the opposite corner, pressing firmly – it will look like a triangle – then fold in the two outer edges on top. Make sure that the edges are sealed well, so that the cheese doesn’t melt out! Fry the Mexican Wontons in a pan of hot vegetable oil until golden brown on all sides – about 1-2 minutes. Place the golden Mexican Wontons on a paper towel to cool and remove any excess oil. You can seal the wonton wrappers as described above or you can bring all of the corners of the wanton wrapper up to the top and pinch all of the edges to seal it tight. 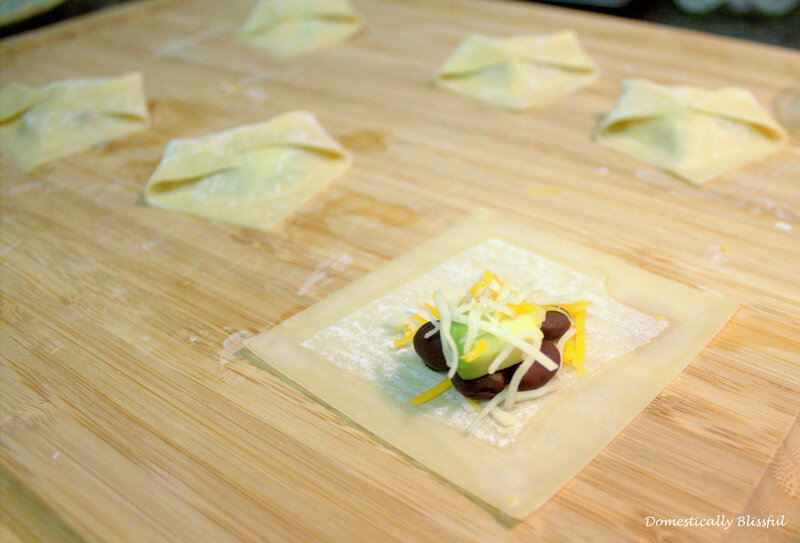 Place the sealed wonton wrappers on an oil sprayed baking sheet – I like to line it with foil for an easier clean up – and spray the tops of each sealed wanton. 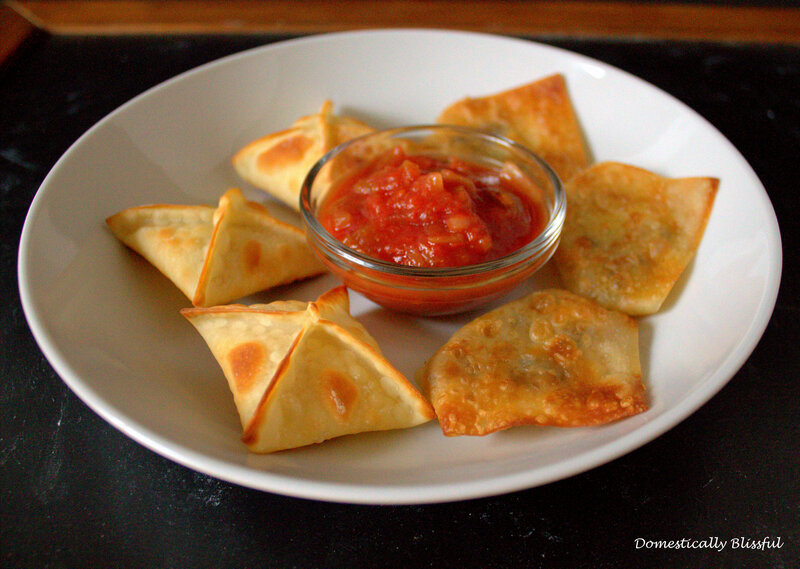 In an oven preheated to 425° bake the Mexican Wontons until golden brown – about 2-3 minutes. Remove from the oven and let cool. 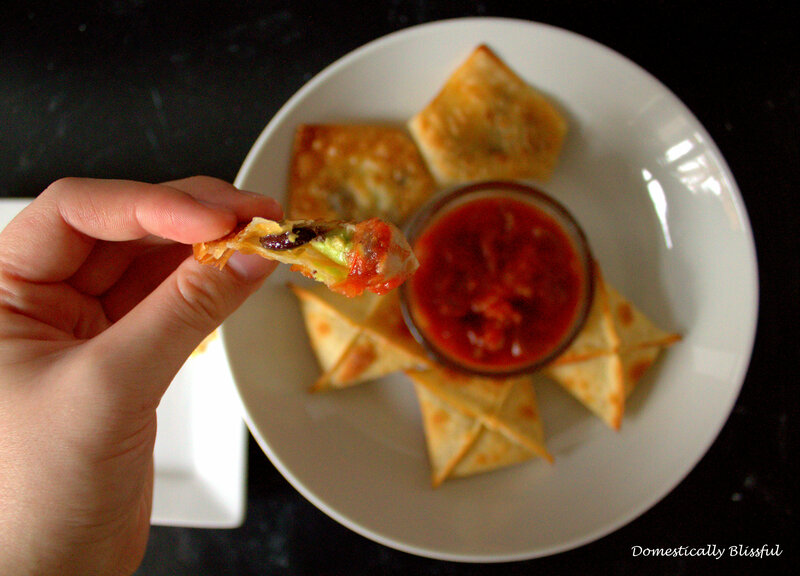 These Mexican Wontons are great served with sour cream and salsa! You can seal the wonton wrappers as described above or you can bring all of the corners of the wonton wrapper up to the top and pinch all of the edges to seal it tight. Lining the baking sheet with foil makes for an easier clean up.